The strategy for apps largely remains dependent on one thing: getting people to actually use them. There are high abandonment rates for app users after initial installs and getting users to come back is a huge challenge. App retargeting can help. By targeting people who have downloaded your app across social media channels and prompting them to get engaged again, you can ensure that usage remains steady. For retailers and brands, apps can become a crucial cornerstone for conversion. In the United States, 71% of mobile sales happen in-app, and advertisers with a shopping app generate 68% of transactions on mobile devices. App users typically browse more products, add more to their shopping baskets, and convert at a higher rate. 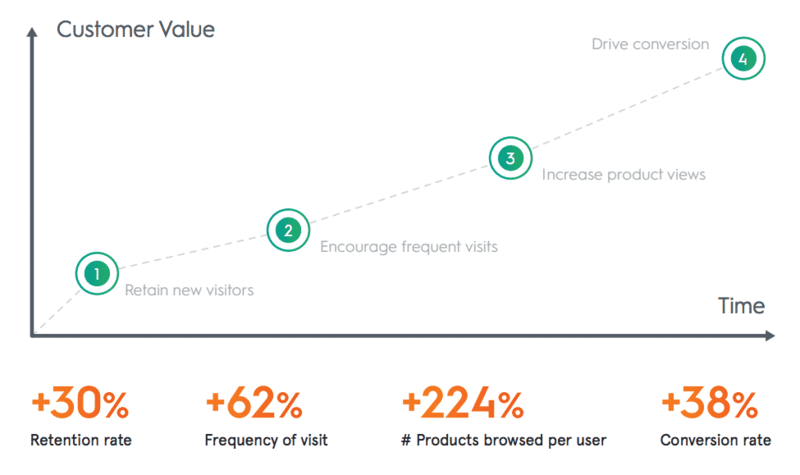 Not only that, the App product page view-to-buyer conversion rate is 3x that of mobile users. So app retargeting can lead to more opportunities to connect with your shoppers, as well as higher conversions. Mobile marketers invest a lot of time and money in their apps. Big budgets are often set aside to drive app downloads, too, because you know that apps can attract and build relationships with high-value users. However, app usage frequently dwindles after the install. 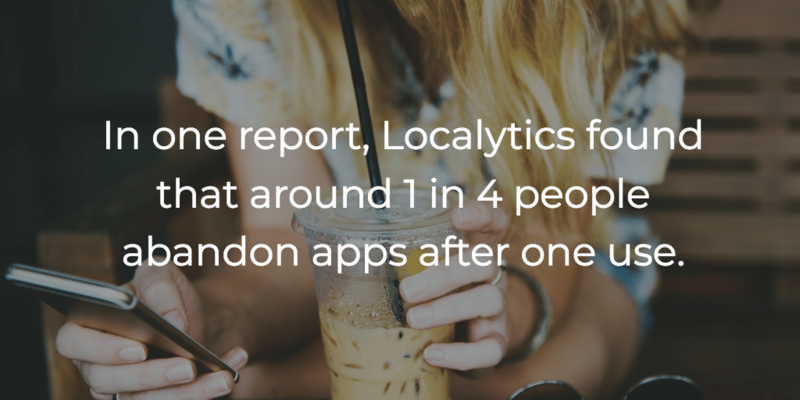 In one report, Localytics found that around 1 in 4 people abandon apps after one use. Without a strategy to actively engage your app downloaders, installed base usage can quickly decrease. Apps that fail to engage users and sit unused are eventually deleted, and the opportunity to engage high value users is lost. The churn of unengaged users happens rapidly after app install, sometimes with just about one in ten users remaining after seven days. Your app can be amazing. But if your users forget about it, all of that effort goes to waste. This is where app advertising technology can really help. Imagine a shopper named Kim is searching for a double room for two adults, for one night in San Francisco. As Kim browses your app, intent data is captured at each event level. Kim finishes browsing, but gets distracted and starts playing a gaming app. If the gaming app is part of your retargeting partner’s publisher network, the retargeting process continues in real-time. Kim’s purchasing intent is calculated, the impression is purchased, product recommendation determined and design of the ad occurs, all in real-time. The ad is displayed reflecting hotels that Kim viewed, plus new discoveries based on items such as availability and pricing. Kim clicks on the ad and is deep-linked back into your app to complete the booking. App Advertising through Criteo Dynamic Retargeting has been built to reengage your app audience and keep you connected to your most valuable users. Criteo’s app retargeting solution leverages the power of Criteo Dynamic Retargeting, a proven technology which wins over 90% of all A/B competitive head-to-head tests. Not only does Criteo’s app retargeting solution bring shoppers back, but once engaged, they’re 30% more likely to return and shop within the app – without further encouragement. Criteo’s app retargeting solution delivers personalized dynamic ads that perfectly scale to all ad sizes across more than 555k mobile apps. Through Criteo Shopper Graph and Criteo Engine, Criteo’s app retargeting solution continuously organizes and analyzes insights from over 1.2 billion active monthly shoppers each year. By recognizing shopper habits like previously viewed and purchased products, sites visited, and interaction, the Engine uses real data to drive the most sales. CheapOair is one of the most popular travel websites and is consistently ranked among the top five online travel agencies by Experian Hitwise. To sustain its leading position in the highly competitive discounted travel segment, the company remains focused on staying in front of travel buyers during critical moments throughout the purchase process. Increasingly, this requires reaching and converting consumers in-app on their mobile devices. By taking full advantage of App Advertising leveraging Criteo Dynamic Retargeting capabilities and reach, CheapOair has continually improved both the efficiency and scale of its mobile performance marketing efforts. With nearly 2M active customers, Lamoda is the largest Russian online fashion retailer, working with about 1000 brands. Lamoda found that users who downloaded the app would often become inactive after a few months or weeks. The company needed a way to revive and sustain app use among these high-value customers to improve ROI from technology investments. Using the industry-leading in-app performance marketing technology, Criteo enabled Lamoda to re-engage lapsed users who had downloaded the Lamoda mobile app with highly relevant, customized messages based on past browsing behaviors. Ads were served across a variety of relevant mobile apps to rekindle interest in Lamoda products. Lamoda was able to reactivate and drive conversions from valuable app users, reaching buyers untapped by other advertising channels. Its in-app campaigns generate significant conversion volumes and high basket values. Trendyol is the leading online fashion retailer in Turkey, with more than 4M unique visitors monthly, according to ComScore. The brand was among the first in market to develop a mobile-centric strategy focused on providing the best possible user experience through a mobile app. Trendyol was looking for a way to maintain an outstanding user experience for app users while maximizing in-app conversions and revenue. Criteo App Advertising performance ads provided the ideal solution – serving personalized recommendations and relevant ads to some of Trendyol’s most valuable customers. Criteo’s mobile in-app ads combine real-time customer behavior data with Trendyol‘s own product catalog and creative content. Trendyol’s in-app campaigns serve fully personalized, dynamic banners to users in real-time, with each ad optimized to maximize conversions within Trendyol‘s ROAS goals. App users are some of the most valuable shoppers a brand can have, but only if they keep coming back to use your app. With app retargeting, you can drive engagement across the entire app usage lifecycle. Whether it’s re-engaging inactive users or driving repeat sales from your best shoppers, app retargeting helps you encourage shoppers to return to your app and ultimately convert them into buyers.